JUDE ------- "Laissez les bons temps rouler. 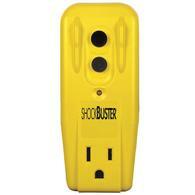 let the good times roll"
A GFCI could save you from a shock. I plan on using a cord mounted GFCI. Or the first outlet on each circuit will be a GFCI and the rest will flow thru it. I would rather have redundantcy than get a shock, but that is the electrican in me. I run big lights in the rain w/o GFCI all the time but I'm always waiting for that shock. are the gfci's breakers any good figure that will protect anything after them? Last edited by Dale M. on Thu Oct 19, 2006 10:14 am, edited 1 time in total. At the very least use one of these. It is a "plug in" GFCI adapter. 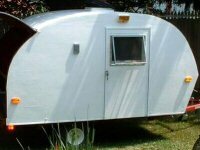 This would be a simple solution for anyone that did not install a GFCI in their trailer. GFI breakers are expensive so that is why most houses have a GFI outlet be the first on a circuit that protects the whole circuit. My house, and probably yours, has a GFI outlet in one bathroom that feeds the an outlet outside and in my garage. 200' of wire instead of more GFI outlets. Gerdo wrote: GFI breakers are expensive so that is why most houses have a GFI outlet be the first on a circuit that protects the whole circuit. My house, and probably yours, has a GFI outlet in one bathroom that feeds the an outlet outside and in my garage. 200' of wire instead of more GFI outlets. That's how I wired my trailer, the first one is GFCI but the other 2 (Galley and Cabin) are regular outlets. Considering that regular outlets are sooo much cheaper, it was the economical way to go. $13 Great price. I would do it. International perspective: in all new houses and rewires here, all socket outlet circuits must be fed through a ELCB (Earth Leakage Circuit Breaker, = GFCI) in the distribution panel. My power inlet is wired directly to a power strip with a built in circuit breaker. From this strip, I am plugging in my battery charger and a small PC fan for battery box venting and cooling. I am not wiring my trailer for AC beyond this. All accessories are DC. Do I need a GFCI for this power strip?? Why is it that people only think about water when looking into GFCI's. They really could save your life or the life of someone who touches your trailer at the wrong time. Even if you only use a drop cord to your camper, it should be GFCI with a built in breaker. They make them with multiple plugs. Your trailer is out side and it’s raining! Do you need a GFCI? YEP!